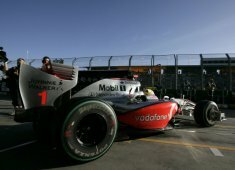 This morning, Dave Ryan was suspended from his position as sporting director of the Vodafone McLaren Mercedes team. Ryan left the team at Malaysia and so far it is unclear when or if he will return to the team. Team principal Martin Whitmarsh said: “In my 20-odd years working for McLaren, I doubt if I’ve met a more dedicated individual than Davey. He's been an integral part of McLaren since 1974 and has played a crucial role in the team’s many world championship successes since that time.